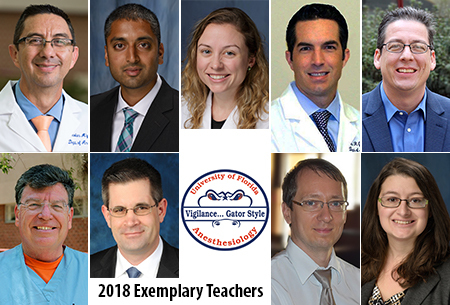 This year nine of our Professors of Anesthesiology have been awarded the Exemplary Teachers Award! Eligible faculty are nominated from each department and participate in a college-wide competition. Faculty are selected based on the excellence of their teaching of medical students, residents and fellows, graduate students, post-docs, and mentorship of other faculty. Congratulations, doctors!